The sudden loss of a loved one is unfathomable. You never imagined you would lose your spouse, parent, or child in an accident. Having them there one day and gone the next is an unimaginable experience. But now that you have experienced this tragedy, you must figure out what to do next. In addition to working through your grief and comforting others, you have to deal with the practical aspects of someone’s death like arranging a funeral and executing his or her will or going through intestacy court if he or she did not leave a final testament. Because this death was caused by an accident, you might also need to consider if a wrongful death suit is right for you and your family. If you want to learn more about wrongful death rights, contact the skilled attorneys at Brown & Gould, PLLC at 405-235-4500. We will discuss your situation and explain Oklahoma’s wrongful death laws in order for you to make an informed decision about how to move forward. Not every death leads to the right to sue someone else. Sometimes accidents are just accidents. But if your loved one was killed because of someone else’s negligence, then you may have the right to sue the person at fault for his or her death. Under OK Stat Section 12-1053, when a death is caused by another person’s wrongful act or omission, the personal representative of the deceased person can maintain an action against the person at fault, but only if the deceased person would have had a cause of action against the person at fault had the decedent lived and was injured. A wrongful death action exists because the person who died would have been able to sue the person at fault if he or she were alive. If this is not the case, you may not have the right to recover for a wrongful death. Oklahoma law calls for the personal representative of the deceased person’s estate to bring the lawsuit. This would be the executor named in the person’s will or the person named by the court during an intestacy proceeding. This person may initiate the lawsuit in court, but the damages requested will be on behalf of the estate and the decedent’s surviving family members. However, if it is not possible for the personal representative to file the lawsuit, Oklahoma law allows the widow of the deceased to bring the suit. If the person was not married, then the next of kin to the deceased can initiate the suit. 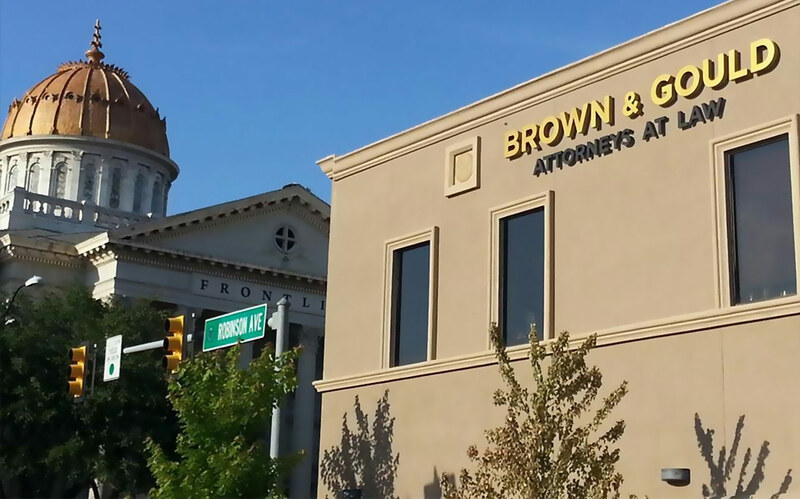 If you believe the person representative of the estate cannot head to court on the estate’s behalf, speak with the attorneys at Brown & Gould to determine who can move forward with this action. Monies spent by the parents in support of the minor child. Each of these types of damages may be distributed slightly differently. Some of the recovery will go to the estate or solely to a surviving spouse, while other damages are distributed to the surviving family members based on the same proportion as the personal property of the decedent is distributed or based on the judge’s discretion. How much of the recovery you receive may depend on your relationship to the decedent, how that person recognized you in his or her will, or Oklahoma’s intestacy laws, if there was no will. The law firm of Brown & Gould, PLLC represents people like you who are trying to recover and move forward after they lose someone they loved. Our experienced lawyers can help you understand Oklahoma’s laws surrounding wrongful death cases and determine whether a suit is right for you and your family. To discuss your legal concern with a qualified lawyer, contact us online or call 405-235-4500.